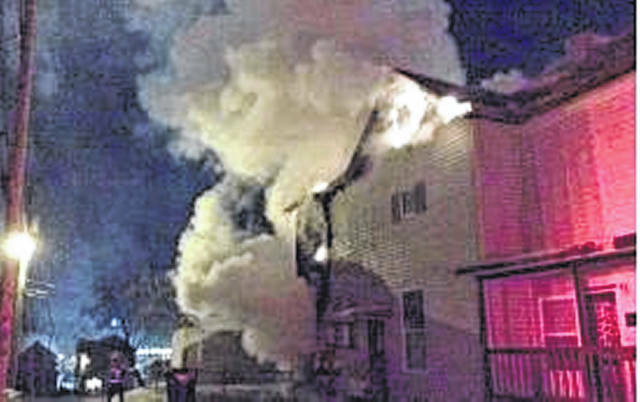 Despite bitter cold temperatures that at the time hovered around or below zero, the Portsmouth Fire Department responded just a few minutes after 5 a.m. Monday to a fire on Vinton Avenue in the city. Assistant Fire Chief Chris Lowery stated the home was vacant except for two dogs housed on the back porch. He said the family which had lived in the home only recently had moved. For whatever reason, they apparently were unable to take their two dogs with them. But Lowery was careful to say the animals had not been abandoned. “They were trying to do the right thing by them,” Lowery said, adding the two dogs even had water dishes which were somehow heated so despite the freezing temperatures, the pets would have water to drink. Probably more importantly, the family had set up heat lamps to keep the dogs warm in the frigid weather. Lowery said while firefighters had completed their investigation, it’s unclear if one of the lamps simply malfunctioned, was damaged by the extreme weather or if one of the dogs damaged one of the lamps. Whatever specifically happened, Lowery said it undoubtedly was one of the lamps that set off the fire. Lowery added a female member of the family had been to the home to check on the dogs apparently just the previous night. It was that person who called the fire department regarding the Monday morning blaze. “She was absolutely devastated when she made that call,” Lowery said. Lowery added one of the dogs escaped the flames. Unfortunately, the other did not. Lowery said the home itself suffered “extensive fire damage” and may or may not be salvageable. What sort of extra effort is needed to fight a fire in near zero temperatures? Lowry said the biggest problem is freezing equipment, such as air packs. Those are the oxygen canisters firefighters carry on their backs. Lowery said the main idea with such equipment is to keep it as dry as possible but in bad weather that can be nearly impossible. Of course, firefighters also have to deal with freezing water. “It’s just a mess,” Lowery said, adding firefighters need to be very careful under those conditions they are not slipping and falling on ice they just created. He noted in this instance, the department called in a salt truck from the city garage to follow behind firefighters and help clear up the ice. Salt trucks apparently also helped clean up the scene of the fire once the blaze was extinguished. Lowery did not say whether or not the bad weather added to the time firefighters spent on the scene but from his comments, it’s likely the frigid temperatures contributed to how long it took to put out the flames. Lowery said firefighters cleared the scene about 9:10 a.m.